Are you in the mood to do a good deed, have a lot of spare cash, and a burning urge to collect Lego sculptures of videogame characters? Then step this way, because I have just the thing for you. It's not often that you get a chance to score major nerd points and major light side points too, so if you've been looking to save some force points on Force Heal, this might just be of interest to you. 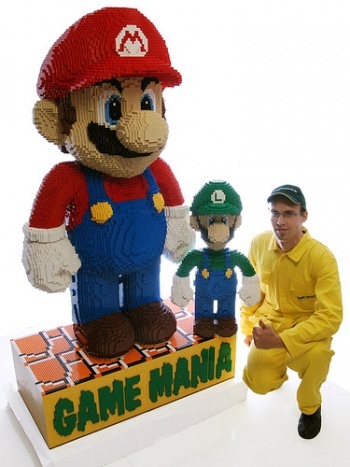 The six foot tall LEGO statue of Mario is made of around 40,000 blocks and weighs around 110lbs, or as much as eight or nine very heavy cats if you need a frame of reference. Its creator, Dutch Lego artist Dirk VH, is selling the piece on Ebay, with any money raised going to charity. The only problem is that starting bid is €2,500, or more than $3,750, which is going to put most people out of the running. But just think, it's only another 72 years before Mario is 100. Think of the resale value then!